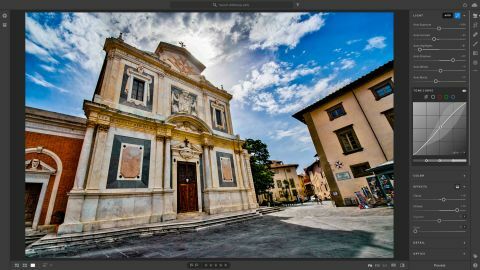 This streamlined version of Adobe's Lightroom is simple to use, but is it worth the price? Lightroom is Adobe’s all-in-one photo cataloging, organising and editing tool. Unlike Photoshop, however, which handles photography, illustration and design, Lightroom is purely for photographers. It doesn’t have Photoshop’s in-depth manipulation, layering, selection and compositing tools. But for regular photo enhancement and repair, it’s fast, efficient and powerful – and all its adjustments are non-destructive. In October 2017 Adobe took a bold step, splitting Lightroom into two products, the new Lightroom CC and a continuation of the old Lightroom as ‘Lightroom Classic’. Lightroom Classic sticks to the old desktop storage model. The new Lightroom CC is slimmer, slicker and based around cloud storage instead. Depending on the Adobe subscription plan you choose, you get Lightroom CC or both versions plus Photoshop – more on this in a moment. The key feature of Lightroom CC 2018 is that your entire image library is available everywhere, on any device. This is different to Lightroom Classic, where it’s only chosen Collections which are synchronised, and even then only by using lower-resolution Smart Previews as editing ‘proxies’. If you’re going to store all your photos online, you’re naturally going to need lots of storage, and this is perhaps the biggest bone of contention. There is a new Lightroom CC subscription plan which gives you Lightroom CC and 1TB of storage, but nothing else. Or you can stay with the existing Photography Plan and get both versions of Lightroom, and Photoshop, but no extra storage. Both options cost £9.98/$9.99 per month. Finally, you can get the best of both worlds with the old Photography Plan plus 1TB of storage, but at a cost of £19.97/$19.99 per month. Whichever way you cut it, that 1TB of storage comes in at around £10/$10 per month. Initially, Adobe indicated that extra storage would cost £10/$10 per month per terabyte; now the Adobe website carries the message “Up to 10 TB of cloud storage available. Call for details,” suggesting (we hope) some flexibility. Fair enough, this is a big one. With Lightroom Classic’s regular desktop storage, you only get to see the image Collections you’ve selected for synchronisation. And while you can organise and even edit images on your smart device and in your web browser, you can’t download the full-resolution versions, only a lower-resolution Smart Preview. That’s fine for placement but you’ll still need to export a full-res version from your desktop library for final use. Adobe also makes a great play of the new, simpler interface. Lightroom’s workspace has always been pretty oppressive and busy, and Lightroom CC’s stripped-back approach is genuinely refreshing. A few things have gone, like the separate Library and Develop modules (now in a single window) and the Map, Book, Slideshow, Print and Web modules are gone completely – but then these are features that probably only a small percentage of photographers would use anyway. And if you are one of those, well, there’s still Lightroom Classic. Lightroom CC’s organisational tools are stripped-down and straightforward, and aided by Adobe’s intelligent Sensei search tool. Who knew we had so many pictures of boats? Lightroom’s organising tools are indeed simpler. Lightroom Classic and its desktop storage system continues to offer two parallel organisational systems – actual Folders and virtual Collections – which even live in separate panels, while Lightroom CC dumps all your photos into a single giant pot, and then it’s up to you how you want to organise them, using Albums and Folders (not real folders, just virtual containers to organise your albums). How can something that does less be better? Lightroom CC does force you into a simpler way of working, but it also strips away all the distraction, confusion and indecision of working with Lightroom Classic. There is one omission that’s quite hard to take, however – you can’t create smart albums (Smart Collections in Lightroom Classic), so you can’t create a smart album to automatically group all the shots taken in Tokyo last November on your Canon EOS 5D Mark IV, for example, or all the shots you’ve taken with a particular lens at a particular ISO setting. There are filter menus for isolating images by star rating, camera used and more, but even these are much reduced compared to those in Lightroom Classic. But Lightroom CC’s trump card is Adobe’s web-based Sensei search technology. Adobe says its machine learning/object recognition technology saves you the drudge of manually keywording your images. Well, it does do a good job of recognising object types, such as trees or skies, but it’s less effective at identifying locations, except where images feature a well-known landmark or have embedded location information. Adobe’s idea of worry-free storage is fine in as much as you don’t have to find space for your photos on your own computer or disk drives, or worry about synchronising them across computers or even about backing them up… but you might worry about how much your ever-expanding image library might cost you in the future. The first version of Lightroom CC back in October 2017 was actually missing more than just smart albums and workflow modules. There was no Tone Curve or Split tone panel amongst the editing tools either. These have been added in a December 2017 update, though, plus automatic image enhancement via Sensei and a full-screen view. Even so, Lightroom CC still lacks some of the bells and whistles of Lightroom Classic, and still doesn’t support plug-ins. Should you buy Lightroom CC 2018? Lightroom CC is a frustrating mix of brilliance (the new, streamlined interface) and disappointment (the lack of feature parity with Lightroom Classic). And tempting as the idea of cloud storage might be, the cost seems too high right now – £10/$10 per terabyte, per month, seems out of step with competing cloud services. Apple will rent you 2TB of iCloud storage for £6.99 per month, for example. Lightroom CC is still a terrific all-in-one image cataloguing and editing tool and it has no cloud-based rivals. The closest are Adobe’s own Lightroom Classic and, say, Phase One Capture One. Capture One is a terrific product, but lacks Lightroom’s multi-platform synchronisation tools. For designers, it’s a complicated decision. Lightroom CC is great for photos, but that’s all. If you work on projects across Adobe’s creative tools, migrating work from Photoshop, through Illustrator to InDesign, for example, Lightroom CC is a bit of an outlier which might be good for organising your photos but is likely to be on the periphery of your main design work. Early adopters might be keen to try out a wholly cloud-based photo library, but the regular Photography Plan with its desktop storage is better value (you get both versions of Lightroom and Photoshop) and Lightroom Classic is still a more powerful organising and editing tool. For designers, Lightroom CC is not so much a ‘must have’ as a ‘might like’.